Prune and walnut log – wow! I dropped the half-hearted purchase I was going ti make myself write about this week and snatched these up as soon as I saw them, standing boldly forth as they were, like a proud, squat dwarf, on the lower-middle rack of the fruit & nut aisle. These just appeal to me on so many levels. It’s like Trader Joe’s designed them specifically for this blog. I mean, where to begin? Take the name itself. It falls squarely into that three letter, central vowel set of monosyllabic utterance that just don’t sound appetizing, words like “gut” and “gob” and “wad”. Etymology aside, there’s just nothing appetizing about extruded food cylinders. “Ready for some homemade turkey dinner?” hard working Mom asks. In a flash the family has gathered around the table, digging with gusto into the uncannily smooth tubular masses that lay heavily upon their plates. No, I’m sorry, it just doesn’t happen that way. Logs are unnerving and strange, and very few foods are acceptable in log format. Festive holiday cheeses and jellied cranberry sauce and, as far as I’m aware, that’s it. Now then, what kind of log are we talking about? Why, it’s prunes. I mean, prunes, seriously? Amazing! Is there any food product that can conjure up images of loosened bowels more efficiently than prunes? I submit to you that there is not. And finally, on top of all of this, we have walnut, to which I am fairly indifferent. So things are looking pretty dire for the ol’ prune and walnut log right from the word go. The packaging, light and cast of translucent, Lunchable-esque plastic, announces that it is “An Ideal Cheese Companion” right smack in the center, in a font larger than the title of the food itself. Serving suggestions are occasionally brazen in their placement, but I’ve never seen one that actually supersedes the contents of the package itself. I pick up a pack of Trader Joe’s Spanish Cheese Tapas Sampler to pair with the log. I may be bringing a roiling cloud of prejudices to the table, but I’m fair dammit. If the log demands a cheese coupling, than cheese it shall have. Upon peeling back the cling film of the prune and walnut logs I am startled and thrilled. The log has been subdivided among the four quadrants of it’s container, this I knew from before. What I didn’t know was that each section was also pre-sliced into three round discs. I pulled back the cling film on the cheese sampler. To my mounting delight I find that each of its three wedges have been pre-sliced into four triangular planes. All the sudden the game has turned upside down on me, as if a secret geometry of the universe had sudden revealed itself. 4 x 3, 3 x 4. I’m staring at 12 slices of each, perfect pairings for each other, as if preordained by the invisible hand of Providence. Is this log tasting going to be perfect? I wonder giddily. 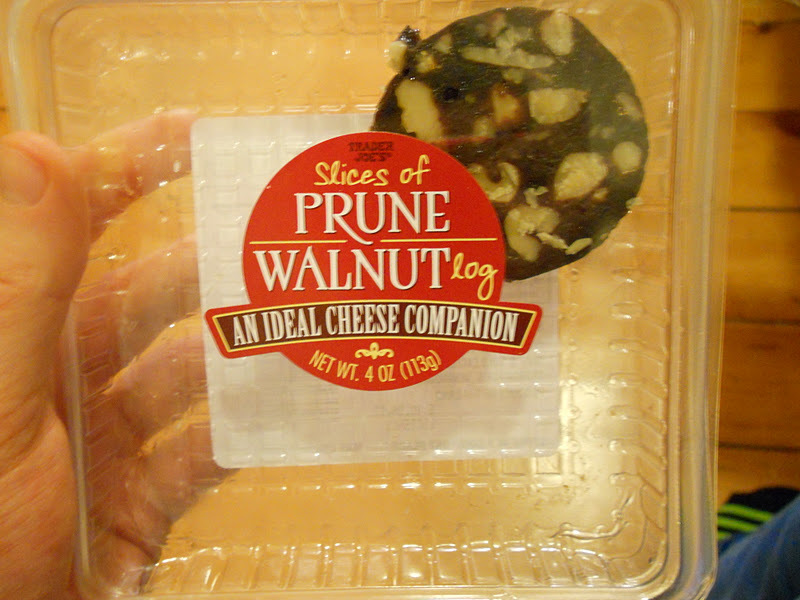 To cut to the chase, three quarters of a page in, yes – the prune walnut log is delicious. I have to hand it to the clever boys over there at Trader Joe’s for the slicing gimmick. In one deft swoop they turned the most unappealing aspect of the log into a boon – simple access for easy pairing without having to bother with a knife or the generally gross look of a nut-studded fruit log. The prune-walnut slices go very nicely with their cheese counterparts – the starchy sweetness of the prune paste benefiting from the clean, nutty crunch of the walnuts, both of which go very nicely with cheese. To my own astonishment I have to recommend this as a ready-to-go party tray or sophisticated snack plate for the sort of get togethers where people look at their food before stuffing it in their gobs (book circles, say, instead of NFL games) . Not too shabby, logs. You’ve turned me around. 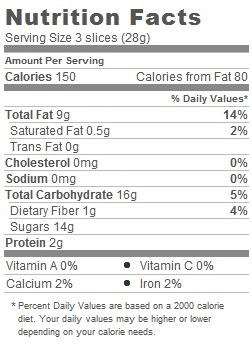 Would I Recommend It: To anyone who enjoys fruit and nuts with their cheese, which should be everyone. Would I Buy It Again: I would gladly trot this out for book club, were I ever to attend one. Final Synopsis: If you like complex tastes that you can layer on a cracker, this log is right up your alley.